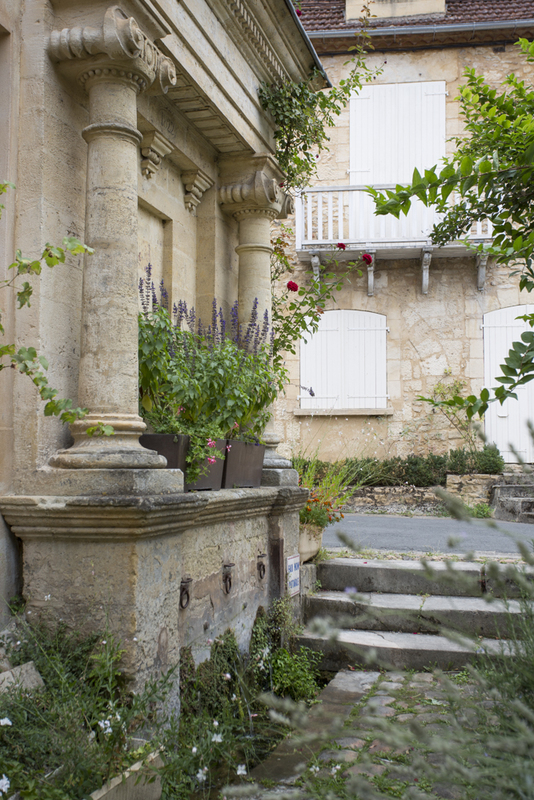 You are greeted with bright summer flowers at Maison Tulipe, a charming stone house in the delightful market town of Le Bugue. 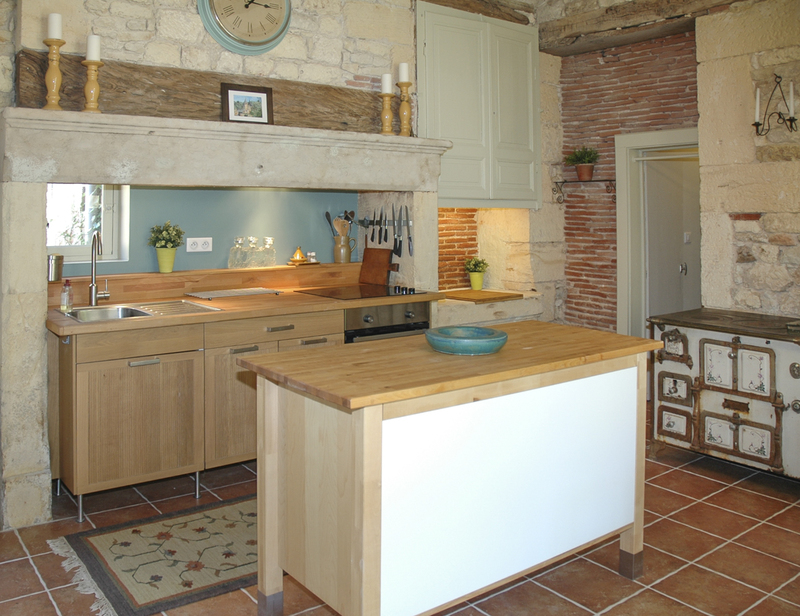 This is the heart of the Dordogne region with so many famous villages and towns within a short drive. 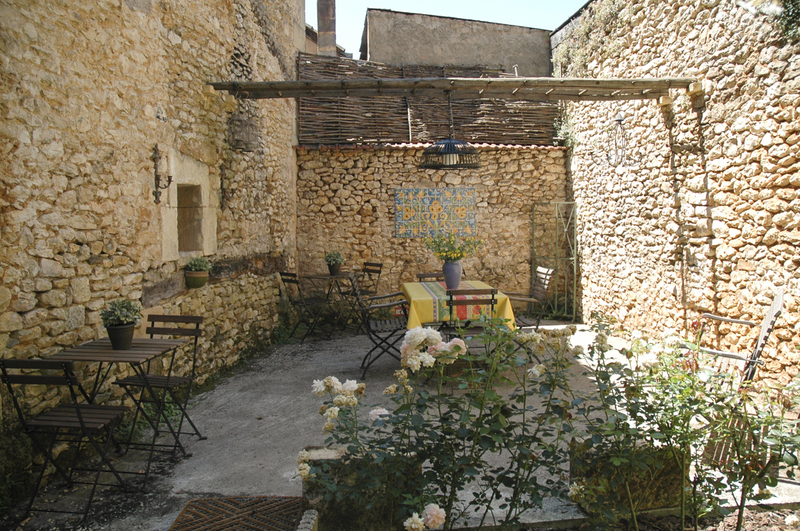 That said, whether you are canoeing on the Vézère, shopping in the weekly market or dining in wonderful restaurants, all within a short stroll, you needn’t go far to experience this captivating area. 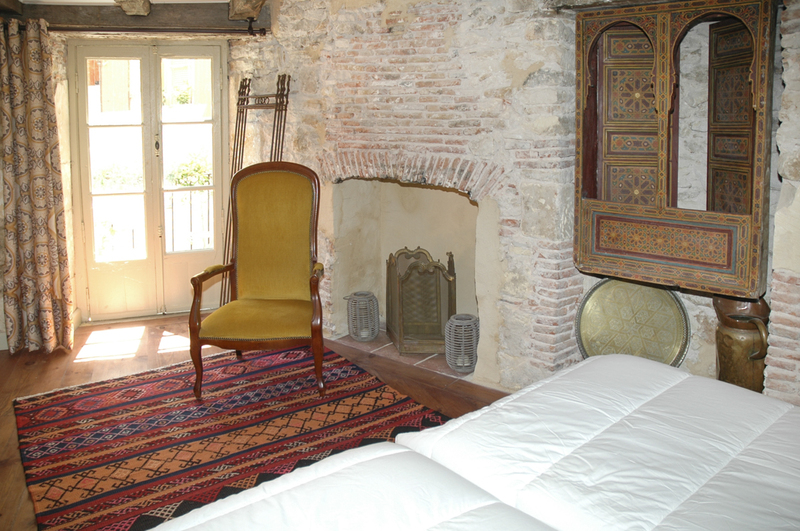 The little maison, dating back to 1822, is on a quiet lane in the cobbled part of Le Bugue. 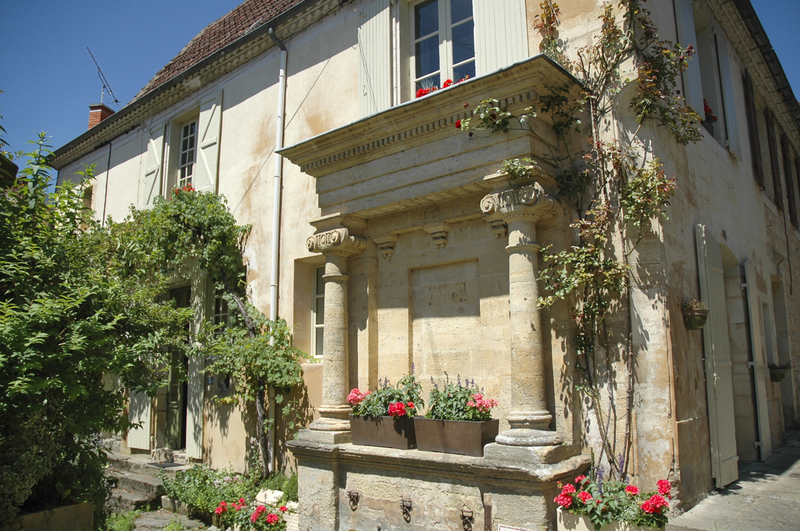 There is an ancient fountain on the outside wall, just one of the characterful features of the house which has been lovingly restored by its owners. What they have created is a wonderful home, full of tradition and history yet with a high level of comfort and many contemporary features. 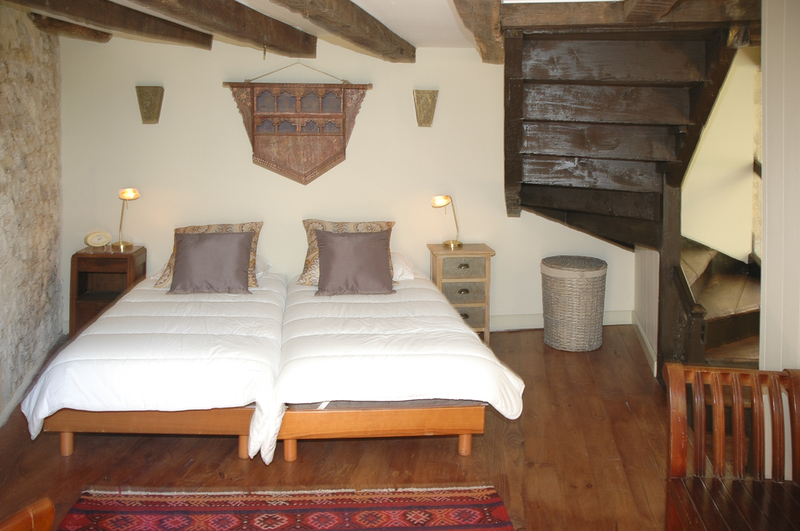 With a pretty bedroom featuring parquet flooring up the old wooden stairs, and a balcony perfect for your morning coffee and croissants, this is a romantic abode perfect for a couple or maybe just two friends wanting to be in the heart of Dordogne. 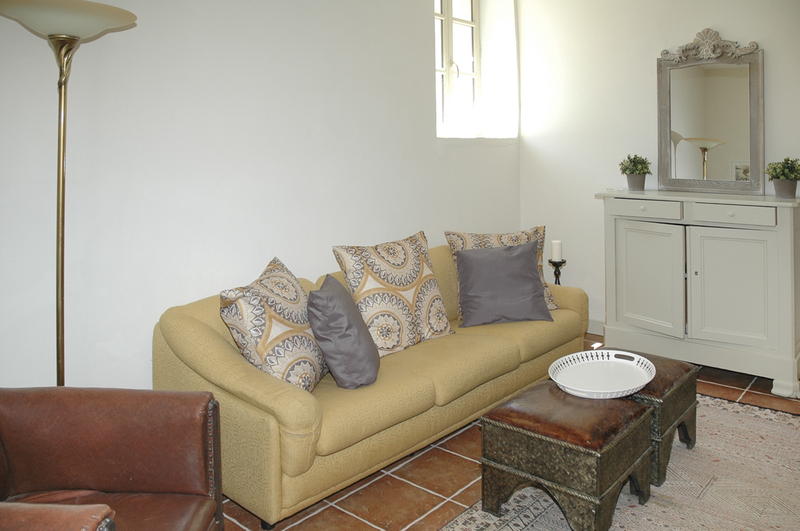 The rose filled courtyard on the ground floor is a delightful place to sit for a sundowner before walking into town to one of the many great places to eat. That said, if you prefer to stay indoors, the kitchen-diner offers ample space to create a feast using local ingredients from the market and the lounge is a comfy room to retire to for long evenings chatting with good wine and company. 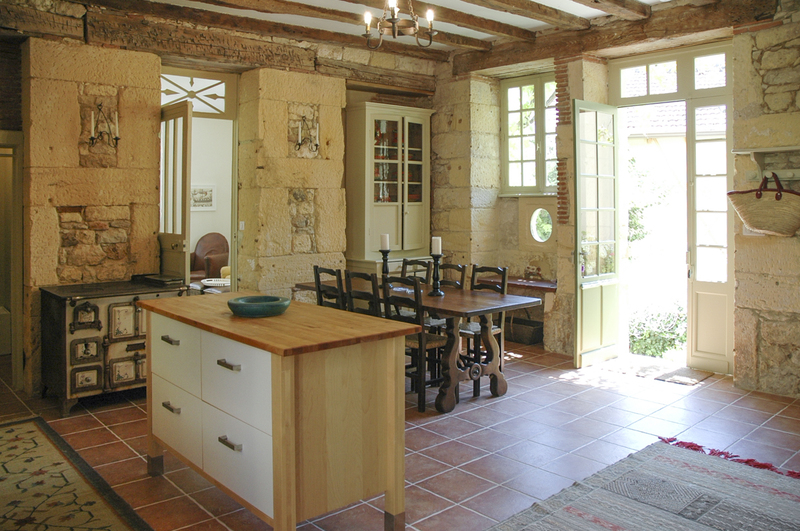 You can wander into Le Bugue where you can pick up your morning croissants from the boulangerie, find pretty patisseries, discover new wines in one of the finest wine caves in the region and dine in a good selection of local eateries. Don’t miss the bustling market on a Tuesday where you can pick up local produce or explore the wonderful bric-a-brac in the local brocante. 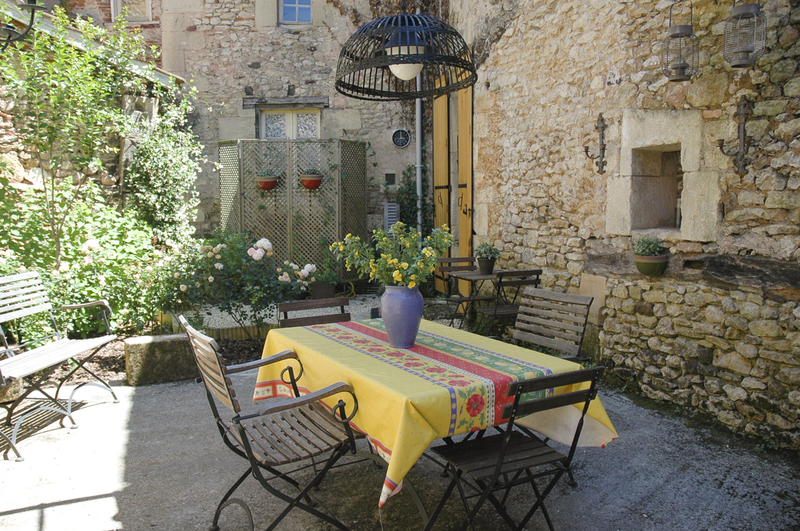 This is the perfect place for a couple or two friends looking for authentic charm in the heart of a wonderful market town with the Dordogne region on your doorstep to explore. You can wander into the heart of Le Bugue within a few minutes where you can pick up your morning croissants from the boulangerie, find pretty patisseries, discover new wines in one of the finest wine caves in the region and dine in a good selection of local eateries. There is also a good choice of supermarkets, banks and other town facilities. Don’t miss the bustling market on a Tuesday where you can pick up local produce to cook up a feast to serve in your tranquil courtyard. The whole region is a true haven for nature and sport lovers alike offering a wide array of outdoor activities, from horse-back riding, to tennis, mountain-biking, golfing and watersports, not to mention the number of hiking and fishing opportunities in the area. Take a hot air balloon across this magnificent region or head to many of the tree-top activities in the forests near Sarlat.